← Should I Spend Donuts On the Yarn Barn and Kathy? 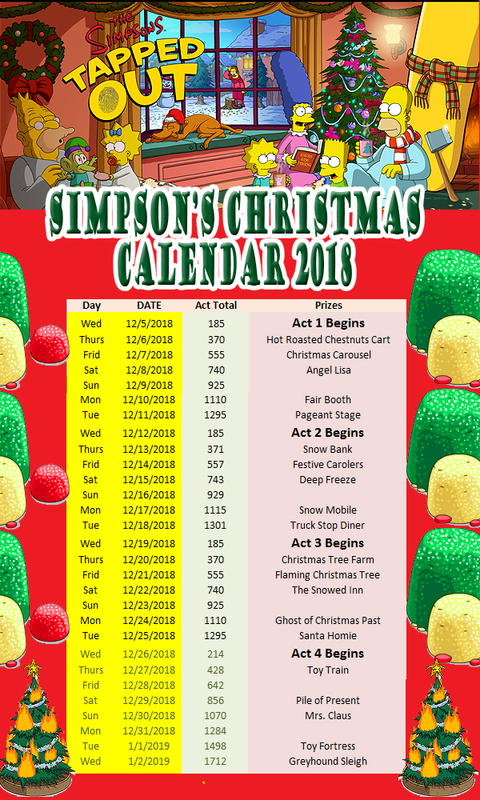 Simpson’s Chistmas Special Event – Calendar and Math to Get It ALL! OK. So…yes…it has been mentioned several times that I was “off the hook” in regards to having to do a calendar. However, with all of the INSANE grousing about the event being different, it seems best to lay it all out for you in a familiar format… so you can CHILLAX!! Let’s cover a couple of basic things…again. 1. You WILL get a ton of land tiles over the course of this event. 2. You are going to get a TON of FREE Stuff…including a couple of characters and some pretty cool decorations. 3. You are going to be able to GET IT ALL… waaaaay easier than before, as well as have the chance to purchase a ton of items with game cash…IF YOU FOLLOW THIS CALENDAR AND DO THIS…. DISCLAIMER…. THERE ARE SOME SERIOUS SPOILERS ON HERE…Kinda. As John from EA was really late in getting us info, and a certain Italian hacker tends to leak all of the info early anyway…I don’t feel bad in revealing a few details early, if for no other reason, than to make it clear that YOU GET A TON OF STUFF FOR FREE. But the trade-off is…I am not going to do a Gregorian Calendar for a handful of 7 day mini-events. Instead, I am going to break this down for the entire event. Who are we kidding? Everyone wants spoilers. That’s why you come to this site…to figure stuff out! Early. Interspersed with these prizes…are at least 12 LAND TILES…TWELVE (and maybe 13). That’s right… EA is actually being generous with land tiles that you can place anywhere you want. So…chillax. Find a place…build it out as you earn the prizes. THE MATH BEHIND THE CALENDAR…. This is pretty simple stuff. For each Act, you have to earn 1300 of whatever the act currency is, in 7 days. Except for the final act, where you have to earn 1500. But anyway you slice it, if you have 10 characters in play every act, and you can keep cycling them every 4 hours, at least 4 times a day…you are going to hit the mark super easily. Even WITHOUT the Premium characters. 6 for every regular character every 4 hours… times 10 is 60 every 4 hours…times 4 is 240 a day minimum. Got it? EAsy!!! AND…if you don’t quite finish an act, you can keep going, even after the next act starts. 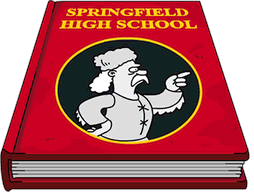 While the Simpson Family is involved with every “story,” there is a rotating cast of characters involved with each one, so you are never “out of time” until the final bell rings on January 2nd. You can only start each Story/Act on each Wednesday…but, again…you have plenty of time to hit your targets. Have FUN!!! CHILLAX!! This on is easy…and has some great stories to come. This entry was posted in Tapped Out and tagged Tapped Out Christmas Event, Tapped Out Tips and Tricks, The Simpsons, The Simpsons Tapped Out, TSTO, TSTO Addicts, TSTO Christmas 2018, TSTO Christmas Calendar, TSTO Community, TSTO Tips and Tricks. Bookmark the permalink. Halfway through the event, and I haven’t seen a single land title. Am I doing something wrong? I dint know what it is, but lately the last few Mini-events” don’t seem as relaxed as they did in the past. I really feel like I’m struggling to finish them in time instead of causally strolling through them. I’m wondering if I’ll be able to compleate act4 on time ? Some furious tapping is now required to get Act 1 completed by tomorow….. It happens a few times a year when I’m on holiday and there is little or no wifi/mobile signal. When I get home, there is little incentive to do the event as the prizes on offer are usually … meh! Thank you for the info. This is really helpful! I just have say I love the drunken Homer carousel animation. This update is all about the funny little things.. love it. And a Merry one to you neighbour Charles from Dex 1 &2! This event is lame. I miss community prizes and tapping presents. What on earth is with the attacking towards the Posters on here? How sad do you have to be to pick apart words used in an article to help you out that you come here specifically for? Ellie needs to take a serious look at her life and some others need to just be quiet and take the useful info if they cant say anything nice. can I just point it the there are a load of characters for this are they all premium or I’m I missing something on the calendar ??? Oh, yeah, and P.S. THANK YOU for all you do for us! Patric, don’t even with the “(and maybe 13)” without telling us–WHY THE MAYBE??? HOW DO WE GET 13??? 😉 I have, oh, maybe 80 spots that could use a land tile, and I would like them all. I have some fairly roomy designs, so I’ve used up MOST of my available space. I still haven’t gotten my entire Krustyland out of jail yet! (Although, I could probably find a nice spot for it somewhere else, if I moved some other stuff. Sigh. Always something to build! Thank you Patric and Alissa for all you do here! I appreciate you guys! Thanks! We appreciate you too! One of my favorite changes is EA moving the character prize to somewhere in the middle of the prize chain, rather than at the end… like it’s been for most of the game’s history. 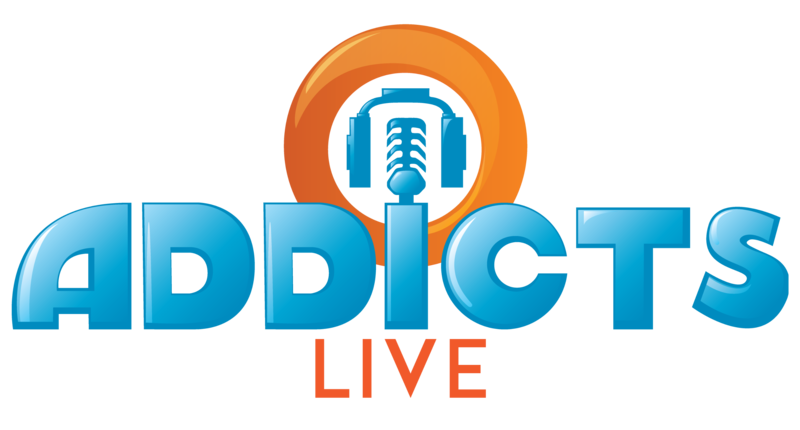 This makes it *much* less of a big deal if ‘life happens’ and even a dedicated Tapper/Addict is unable to get it all. You should stop with the snide comments about the Italian “hacker”. He looked at the files on the server just as Alissa always did. If he is a “hacker” so is Alissa. Also stop copying and pasting his work from the wiki and then trashing him. He refers to him as a hacker not because he looks at the files on the server. He refers to him as a hacker because he was (maybe still is) friends with him in the game…and his hundreds of thousands of hacked donuts. (he’s also admitted to Patric via email that he’s hacked donuts) Ergo…hacker. 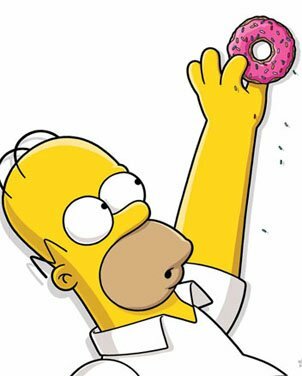 People who cheat the system (especially in the era of donut farming, the legit way to acquire donuts) have never had respect around here, and they never will. Hacking donuts is stealing, plain and simple. So are you really defending a thief? And what’s copied and pasted? Every piece of information Patric has is from me, verified in game or via information from EA. Then hacker may be the right term, but the wording to me implies about the spoilers not for another reason. You also know when the files hit the servers and could see what was in them. But why did you have to go out of your way to call someone out anyway? Is Patric bored again because he always starts a bunch of crap when he’s bored. And I have proof of the copying and pasting. It was not on this article, but a few months ago. It was changes in an update copied exactly from the wiki. Including misspellings. I don’t know why you all have to be so nasty and mean about the dumbest things. People come here for game info not petty jealousy. I’m not forcing you to be here and if you’re not happy you’re free to explore other TSTO sites. Excuse me, but did you come here just to attack the staff? Who made you the TSTO Police? I don’t see anyone else complaining about it, so, honestly, it looks to me like the only petty jealous one here is you. Yes, what they ^ said. Also, Ellie is entitled to her opinion, and you’re being unkind by calling her petty and jealous, which she is not. It’s no wonder why a lot of regulars don’t frequent this site anymore. Kitty… you have been around for a long time…and are even one of my neighbors. But I can assure you, wha she posted is not only incorrect, but slightly libelous. Trust me whenInsay that The person in question, has onecenagain broken the NDA with have with EA. He ignores the agreement we all have, and continuing to defend him only proves that you eithter don’t know the facts, or are fine with his actions. We are not. Simple as that. And by “regulars,” not really sure what you are talking about…as most of the “regulars” are in support of what we wrote. I really wasn’t aware that we are Tapped out neighbours… Are you sure you have the right kitty?? (May I ask how your username begins)? I am defending Ellie because I think she is nice, another tapped out site I used to visit, she was also a member on there,and she was always nice with her comments etc. I’m not defending the “hacker” you have spoken of, I was saying to ‘blistering barnacle’ that there was no need to be unkind to Ellie. Regarding regulars, there are a lot of names I used to see pop up, that I don’t anymore, myself included, you will notice I don’t comment or visit anymore. I am here now for the update, I am grateful to you, Alissa, & Safi and Wookiee for when he used to write posts for all for the information that you all always have available for this game. Petty jealousy? Pffffftttt… sorry, but simply copying info from the files does not breed contempt or jealousy from me. What I must ask…is that if Gio gives you all of the info you need, why are you here??? Bored? I would have to ask you the same thing…don’t you have something else to do with your time? Ellie…… I haven’t copied anything from him in years…because he is often wrong. But that aside, “hacker” is not a derogatory term…just a descriptive verb about how he gets info. He does however, break the NDA we all signed…regularly, putting all of our relations with EA at risk. When he stops posting content WAY ahead of the agreement, I will show him the respect you seem to think he deserves. So…chill. Thanks for the calendar!! 🙂 Looking forward to a stress-free Christmas event!! Side note.. do you ever think they will let us have more land in the Springfield Heights area? I’d rather start expanding that way. Happy Early Christmas to you all!! I have 11 characters that are currently gathering Programs. Bonus!! Too bad we can’t start the next act early if we finish the previous one. I won’t be able to visit my game for any of the fourth week. Santa will be lonely for one more year. Enjoying the event so far although apart from the angel skin everything else for act 1 seems a bit meh however I do like the animation for the carousel . But act two Onwards all of the prizes seem (to me at least) significantly more better and interesting. Not a skin. Full character. Ah fair enough I stand corrected I wrongly assumed it was a skin for Lisa. As did I…in fact, I wish it WAS a skin. But, that is another topic for discussion. I’m with you Patric, I’d be happier if it was a skin. I don’t like a bunch of the same character running around the game just because they have a different look. This is why I won’t intentionally buy the grown up Maggie rocker. I don’t mind them splitting off as separate characters… if they’re free. I prefer EA doing them as skins if they aren’t. For example, don’t split off a character and try to charge me 150-175 donuts for it. For a few seconds I was confused why angle Lisa was running around my Springfield when I knew I just put Lisa on a task. Thank you for the math and explanation. I Appreciate all the work you guys do. We’re calling 12 a “ton” now? After weeks without any? I mean ok I’ll take it but it doesn’t put a dent into what’s available for anyone. How much land do you need? Sounds like a new Friday Filler idea. You have often mentioned you don’t buy everything. Others buy everything. If want to keep “canon” items a good distant away from things like the Krustyland, “superheroes” etc. you want a lot of land. Others like great forests, rivers, lakes, etc. And then there are the farmers. Who wants a big farm in their town? Yep. It always comes down to the hyper farmers. I farm 38 KEMs. I earn 50+ a day. No clutter. Faaaar away from my town and in its own Hydroponic farm segment (bordered by water to make the KEMs stay straight. Trust me…while I don’t have every item offered…I have wasaaaay more than enough land. I could “have it all” with room to spare. You have access to my main town, check if you think I have room to spare. Thanks for putting the calendar together. That’s mostly my gripe. Instead of being able to buy one row or column at a time to expand east or south at my leisure, it suddenly jumps 5 or 10 tiles to east by force…and then you get 3 tiles in 6 weeks to expand crappily to the South. It’s really the assymetry that annoys me. Along with the whole Springfield Heights being 1/4th the width now. But again, that’s a symmetry issue. And don’t get me started on the goofy multiplier area during events, which messes with design. Then boom, next event with more of the same. But those are gripes. I actually love the game and this site more than I probably should. Appreciate all that you do. You call THAT a calendar? Seriously? LOL…I do not. I call it a digital graphic that is designed to placate those too lazy to do some basic math! Actually, I couldn’t make sense of how to do a four week Gregorian Calendar with all of the overlap. So…you get a bunch of numbers. Good morning TSTO Addicts team. Are the land tokens prizes? I don’t see them anywhere. How do I earn them? Thanks Merry Christmas. They’re prizes with another prize. As indicated in the turbo tapping post. There’s no graphic for them on the track however. The only way that I know to see how many land tokens you have earned is to go to the buy land screen. When you select a land tile if you have earned a token the land upgrade pop up should show that you can choose either cash or a land token to purchase the tile. I didn’t realize this the first time I won a free land token. I appreciate the possibility to continue an act after the week passes, all those land tiles and the fact that the new characters are not the final prices. Good job EA!